This book had me gripped from page one. It is difficult to categorize: thriller, yes; beautifully-written, yes; sexually-charged, yes; ghosts and spirits, yes. 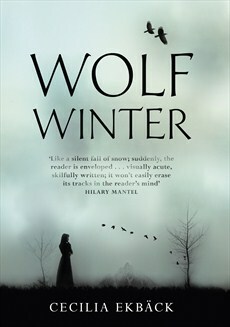 ‘Wolf Winter’ by Cecilia Ekback is a chilling Nordic thriller set in a bleak winter landscape deep in snow, the mutilated body of a man is found by two young girls and the ramifications reverberate throughout the winter months. This disparate community of families, residents and itinerant Lapps, feel threatened by something on their mountain, Blackåsen. It is a hard life for newcomer Maija and her two daughters Frederika and Dorotea. Maija’s husband leaves them for the winter to get a job on the coast, and so Maija deals with the unnamed threat in her own way, a way which some locals see as suspicious, perhaps even witchery. The mountain is there on every page, the wind, the snow, the cold. The Swedish expression ‘wolf winter’ means two things: an unusually bitter and long winter, and the darkest time in a person’s life. Both apply to this novel. Excellent. This is Ekback’s debut novel and I look forward to the second. For Cecilia Ekback’s website, click here.